Charles Moore Stratton and Bessie Boyce married in Penrith in 1904. 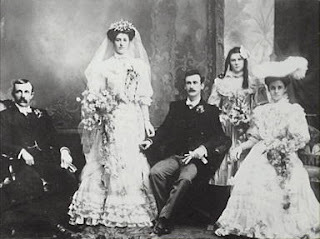 Bessie was the daughter of William Boyce and wife Elizabeth (nee Warren), while Charles was the son of James Stratton and Isabella (nee Malone) who are believed to be the older couple in the photograph at left. The Stratton family were early residents of the Springwood area; James, a butcher, acquired land at Faulconbridge in 1869. Today, Everton House (built by the Hon. John Meeks) and Faulconbridge Public School exist on the property. Blue Mountains City Council local studies collection image files. The Making Of A Mountain Community: A Biographical Dictionary of the Springwood District, Springwood District. Bessie Stratton (nee Boyce) was my grandmother's sister - her name was Catherine and she married Clarence Edgar Felton Hughes a Dentist in Randwick who was also a Mayor of Mascot. I believe that there is a connection with the village of NEWLYN in Cornwall but still working on finding out more details. I believe that the parents of Bessie & Catherine lived at Waverley (suburb of Sydney). Again still putting the details together. I spent many happy times in Springwood as a child and remember that the post lady came on horseback.